The internal combustion engine of a vehicle emits exhaust gases during its combustion process. It would be bad if those gases were to stay in the engine which is why cars are built with an exhaust system. This is basically piping that allows the exhaust gases to flow out from the engine. The piping leads the exhaust gases all the way through the tailpipe and out into the environment. Sometimes you will notice water coming out of the tailpipe. This means that water is coming from your exhaust system for some reason. You don’t necessarily have to panic when this happens because it doesn’t always mean there is a problem. You just need to understand all the possible reasons for why there would be water coming out of the exhaust. That way, you can recognize the signs for what they are. If it does happen to be serious, then you will be able to tell on your own before taking it to a mechanic. 1) Engine Water Condensation – When your engine goes through the internal combustion process, there are various pollutants that form. The three main pollutants are water vapor, nitrogen, and carbon dioxide. As the exhaust gasses are leaving the chamber, the carbon dioxide and water are getting mixed together. The more the engine cools down, the water condensation in the exhaust becomes visible to those from the outside. The tailpipe will have small drips of water coming out of it. 2) Hot Engine – Your engine will generate the most heat when you first start your car. The oil in the engine still needs time to flow and lubricate the components to cool them down. But, while the engine is hot, the exhaust system will be hot as well. This will create water vapor in the exhaust if the temperatures of the environment are cold. As a result, water droplets will come out of the tailpipe for a couple of minutes and then clear up. If they don’t clear up, then it could mean big trouble. 3) Catalytic Converter – Every car has a component called a catalytic converter. This component lowers the amount of toxic gas emissions being emitted from the exhaust system. That way, the emissions are not as harmful to the environment or people. During the conversion process, traces of water vapor are produced. This will result in water droplets falling out of the tailpipe. 4) Bad Piston or Rings – The first three reasons listed here are nothing to worry about. The time when you should start worrying is if the water coming from your exhaust is because of a bad piston or bad piston rings. This is usually the case if your tailpipe has water and smoke coming out of it at the same time. You may even smell a burning odor too. In some cases, the odor might smell sweet which would be even worse. Regardless, you would need to take your car to the auto shop immediately to get this problem fixed. Most of these reasons are due to water vapor effects. If it is cold outside in your environment, your tailpipe and the other components of your vehicle are going to be cold. This means that the heat generated from your vehicle while it is running will cause water condensation to form wherever there is water vapor present. 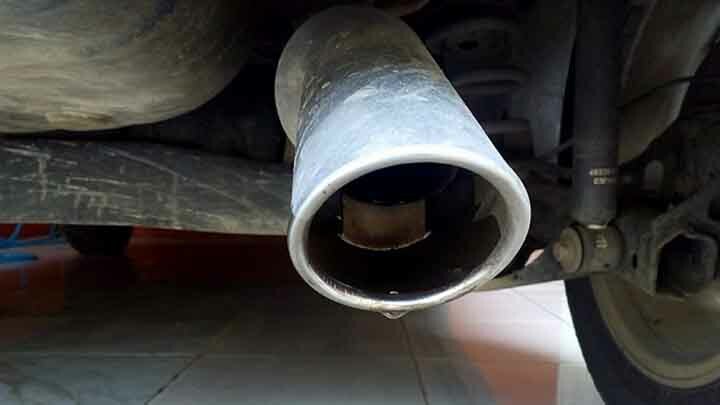 Since water vapor is commonly found in the exhaust system, then this is why so much of the water condensation flows out of the tailpipe.